First you need to hard boil the eggs! Place the eggs in a pot, add just enough cold water so that they are fully covered, and put on high heat. Once they�fve cooled, peel them and cut them lengthwise. Place the whites on a plate and the yolks in a bowl. Add the remaining ingredients (except for the paprika) to the yolks in the bowl, and mash it all together. 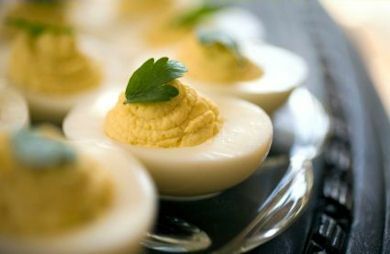 Once it is mostly uniform, smoosh the mixture back into the empty egg whites, top with a sprinkle of paprika, and enjoy!